Pacey’s provides most services to Whistler, Pemberton and the surrounding areas. This piano moving, piano tuning, piano restoration, piano appraisals, piano sales and piano rentals. We rent pianos for any length of time to Whistler, 1 and 2 day rentals for events, several month rentals for a season on the mountain, and year long rentals. 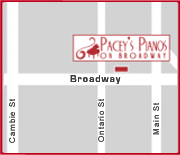 Pacey’s covers the Whistler area for famous brands like Mason & Hamlin, Schulze-Pollmann, Bohemia, Knabe, Orange Digital, and used Yamaha pianos. Pacey’s is the Whistler piano store!